Why have I never eaten a gooseberry? These tart, green or red berries were once very popular in North America, as they are very hardy and easy to grow. However, early in the 1900s, gooseberries and currants were discovered to be an alternate host of the white pine blister rust disease that was threatening populations of pines. Because of this, many gooseberry (and currant) plantings were removed, and growing these plants is still illegal in some areas (special permits are required in Idaho, New Hampshire, New Jersey, Vermont and Washington). 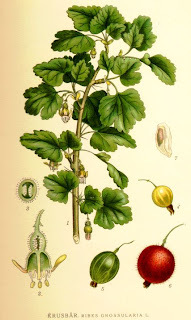 Removing these plants hasn't been very successful in combating the disease, however, so gooseberries and currants are regaining some of their popularity. Gooseberries are very hardy, and are even said to grow better in latitudes further north. They can tolerate some shade, and may even appreciate some protection from hot afternoon sun. Good air circulation will help reduce their susceptibility to mildew, as will planting newer, mildew-resistant varieties. Gooseberries will also grow in most soil conditions, although they prefer a soil that is not too acid, or slightly alkaline. In fact, it seems that they will grow almost anywhere, as long as they get some sun. They are usually quite compact, with most varieties growing no more than about three feet tall, and are self-fertile, which means they don't need another plant nearby to set fruit, which makes them a welcome addition to a small garden. Most gooseberries are quite tart in flavour and sport large thorns. Like tart, prickly raspberries, they are often used in preserves, although there are many new varieties that are sweet enough to eat right off the bush, and won't attack you for your troubles. Thoreson, which is very hardy and prolific, as well as having few thorns, or Hinnomaki Yellow and Hinnomaki Red, which are both fairly sweet and very hardy. Gooseberry bushes need little pruning, but they can be thinned by cutting out canes that are more than four or five years old to improve their production. They are also easily propagated by cuttings or layering, and will generally bear a large crop in their fourth year. How can I grow it indoors ? Anonymous, I'm not sure that you would be successful growing gooseberries indoors for very long. I believe (although I'm not positive) that they will require winter chilling, which means a certain number of days near or below freezing. Without this natural cycle of seasons, I doubt the plant would do very well, and I'm pretty sure it wouldn't fruit. If, on the other hand, you could put it outside for the winter, in a large pot, it may grow and fruit indoors during the summer if it gets enough light. I'm confused. My plant has thorns even on the berry. Does this cook away? How do I make jam or jelly with a thorny berry? Yes, keep them outside, planted in the ground. I live in Manitoba, Canada and grow my gooseberries outside. They need a winter chilling period. Most are very hardy and have no problem surviving my zone 2b winters. Can i Grow them in Chicago ? To the gardener from Chicago: with the greatest ease. You may also wish to try for fun, Ribes odoratum, Jahn's Prairie. Thank you, Cassandra, for information about varieties Thoreson and Pembina Pride. Are they available in the lower 48 USA? Any source info? Thanks much. Gautam, Thoreson and Pembina Pride are alternate names for the same cultivar, also called Friesen's Mammoth. I've never seen it in commerce in the US, but it's in the USDA germplasm repository and cuttings for propagation can be requested. I'm rooting some now.